FLINT, Mich. -- In 1994, activists opposing the construction of a wood-fired power plant here asked U.S. EPA for help, arguing the project would spew toxic pollutants into their poor, largely African-American neighborhood. 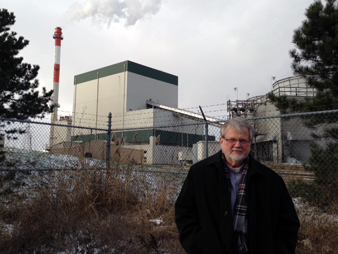 At issue: Would granting a permit to the power plant violate the community's civil rights? Twenty-one years later, the Genesee Power Station's smokestacks are puffing away, and its neighbors are still waiting for an answer. "It's kind of a race. Is the Second Coming going to happen, or am I going to hear from the EPA?" said the Rev. Phil Schmitter, a 69-year-old Catholic priest who sent the call for help to EPA. "Right now, I'm betting on the Second Coming." Schmitter and the Flint activists aren't alone in being kept waiting by EPA's Office of Civil Rights. The agency has accepted or partly accepted 17 cases that haven't yet been resolved. Those date back to 1994, according to a log that tracks complaints. The complaint against Genesee has been languishing the longest, but it's one of five filed in the 1990s that were accepted but never finalized. "It's a travesty," said Vernice Miller-Travis, a longtime environmental justice advocate who serves on EPA's environmental justice advisory council. "It's a clear violation of the 1964 Civil Rights Act. "If there was a program office at EPA that decided that it didn't understand, it didn't agree with it, didn't want to, it just didn't feel like enforcing some part of an environmental statute, there would be hell to pay," she said. "But there is no such penalty within the agency for not being compliant with civil rights laws and statutes. It's such a glaring inequity." EPA's press office would not make an official in the civil rights office available for an interview for this story. Spokeswoman Monica Lee said in a statement the office is "working diligently" to resolve the Genesee case "as quickly as possible while ensuring the quality and consistency of its investigation." Father Phil Schmitter still hasn’t heard back from EPA about the civil rights complaint he filed against this power plant more than two decades ago. Photo by Robin Bravender. "The agency has made improving its civil rights compliance program a priority," including its enforcement of civil rights laws, "and is committed to establishing a model civil rights program," Lee added. "There's still progress that needs to be made to accomplish this goal, and we continue to take significant and strategic steps to improve the efficiency and effectiveness of the program to ensure recipients' compliance with the civil rights laws." Meanwhile, the power plant started running, several of the people who battled its construction have died, and others have largely forgotten about the matter. Even those who were most central to the effort have largely given up hope of ever hearing back from EPA. Schmitter returned recently to visit the power plant on the outskirts of Flint. It lies at the end of an isolated road called Energy Drive that's lined with evergreen trees and dense green brush. The small plant -- surrounded by a barbed-wire fence -- is fueled by piles of waste wood from nearby heaps that form a small dirt-colored mountain. White steam billows into the cloudy sky from a tall red-and-white-striped smokestack. There was little odor on the cold winter day, but when scrap piles get wet, Schmitter said, the locals will occasionally get a whiff of an acrid stench. "You kind of gag on it," he said. The incinerator is owned by a partnership that includes Jackson, Mich.-based CMS Enterprises and White Plains, N.Y.-based Fortistar. It's a 40-megawatt biomass-fueled plant that burns everything from tree trimmings to construction debris and other industrial wood wastes, according to CMS's website. The company sells the power to Consumers Energy Co. -- enough to power about 40,000 homes. Neither CMS nor Fortistar responded to requests for comment on this story. The plant started operations while its opponents were waiting to hear back from EPA. It's been up and running since 1995. "We've done as much as we can do," Schmitter said, looking out at the plant. "It was mostly a lost battle." Flint religious leaders and community groups started their war against the plant before it was constructed, arguing it would damage public health and disproportionately harm residents who were already exposed to more than their fair share of pollution. "In that corner of Flint, there is just a lot of polluting stuff that's either in Genesee Township or the northeast side of Flint, and nothing has ever really been done about that," Schmitter said. The plant is about a mile from an elementary school and a low-income housing complex. 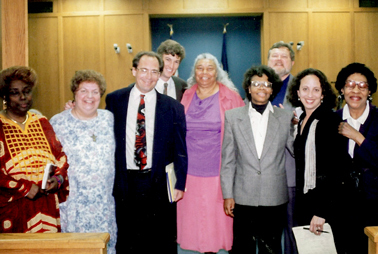 Activists opposed to the Genesee Power Plant gathered in a courtroom in 1997. Sister Joanne Chiaverini (second from left), Lillian Robinson (center wearing pink) and Schmitter (back right). Photo courtesy of St. Francis Prayer Center. Schmitter and Sister Joanne Chiaverini, who were co-directors at the St. Francis Prayer Center, about a mile down the road from the Genesee plant, were central to that fight. They teamed up with local environmental and civil rights groups in an unsuccessful bid to halt construction. The prayer center still has scrapbooks full of photos and news clippings documenting their efforts. Opponents warned the plant would add to elevated levels of lead and other dangerous pollutants in the air by burning demolition wood containing lead-based paint. They argued that the air pollution permits issued to the plant failed to properly account for the racial and environmental impacts the plant would have in a community whose population is predominately African-American. Flint's population was nearly 53 percent black or African-American in 2000 -- a number that had climbed to nearly 57 percent in 2010, according to the Census Bureau. Schmitter and Chiaverini drew up a complaint to file in 1994 with EPA's civil rights program. Federal civil rights laws allow people to file administrative complaints to federal agencies if they believe recipients of federal cash (in this case, the state of Michigan) took discriminatory actions. It's the only document he ever typed on a computer, Schmitter said. "We were in a real time crunch." By then, the plant was already under construction. "Several people filed it, and Sister Joanne and I just happened to word it right," he added. They got a letter back from EPA saying they had filed the complaint within the appropriate time frame. He remembers getting a visit from EPA staffers from the agency's Washington, D.C., headquarters a few years back, but he never heard back after their visit. "There was nothing remotely substantial," he said. "They haven't done one thing about it." Several of Schmitter's former allies have died in the time it's taken EPA to follow up. And for the most part, people in Flint have stopped paying attention to the power plant that's churning away on the outskirts of the city. "I think people have given up," Schmitter said. "This is ancient history ... so the EPA, I guess, must have a shelf they put this stuff on where they say, good, they're all dead, so we don't have to mess with that anymore." Chiaverini died in 2008 after complications from a heart valve replacement, local press reported. She was 68. Lillian Robinson, a local activist who was central to the fight against the plant, died of cancer in 2007 at age 79, The Flint Journal reported. Janice O'Neal, another opponent of the facility and a college instructor, died in 2002 at age 53. Schmitter has since left his job at the prayer center; he's been the pastor at Christ the King Church across town since 2009. The lengthy delay in hearing back from EPA was disappointing to others who were central to the effort. Many of them have since moved on, too. "It really wore people down and became an area of much frustration. People were just sort of banging their heads against the wall," said Julie Hurwitz, who was executive director of the Sugar Law Center for Economic & Social Justice -- a nonprofit public interest legal center that represented opponents of the power plant -- from 1998 until 2004. She's now a partner at a civil rights law firm in Detroit. Hurwitz penned an exasperated letter to EPA's civil rights office in 2000. "We write this letter to formally inquire about the status of the [Genesee] case and to convey our ongoing serious concern regarding the delay in resolving this matter," she wrote then. "... [D]uring the pendency of this investigation, the Genesee Power Station has been built, is operating, has assumed a place on EPA's Significant Violators List, has been cited by the Michigan Department of Environmental Quality, has entered into a Consent Judgment based on these violations, and continues to adversely affect the health and welfare of the surrounding community." Fifteen years later, she's still frustrated. "My feeling about the EPA is that they have placed very little value on environmental racism, and when people are being hurt and they complain, that counts as zero," she said. But working out civil rights complaints can be complicated, and resolving them gets even tougher as time passes, according to former EPA employees who worked closely with the program. Complaints to EPA under Title VI of the Civil Rights Act -- which prohibits recipients of federal funding from using the money in a way that has a discriminatory impact based on race, color or national origin -- presented "a novel combination of civil rights and environmental concerns," said a former senior EPA official who worked on civil rights issues. EPA, the former official said, "initially had no policies or procedures for dealing with them and lacked the analytic tools necessary to address the issue of disparate environmental impact that was at the heart of the complaints." In the early years of the program, processing complaints "was further complicated by the lack of case law and staff expertise within the Office of Civil Rights to address environmental impact concerns," that person said. On top of those hurdles, "there were always inadequate resources" for funding the office. The Obama administration has received some credit for tackling long-standing problems in the civil rights program. Early in Obama's tenure, then-EPA Administrator Lisa Jackson commissioned a broad study of the program. The sweeping evaluation issued in 2011 by Deloitte Consulting LLP depicted the office as a troubled program that had been plagued by leadership problems and misplaced priorities for years. The report found that EPA had failed to properly address allegations of discrimination, seemed to lose sight of its mission and priorities, and struggled to effectively resolve equal employment opportunity violations inside the agency (Greenwire, April 4, 2011). In the wake of the Deloitte findings, Jackson called for a revitalization of the civil rights shop. EPA issued a report in April 2012 touting progress it had made in addressing the backlog of complaints and pointing to the appointment of a special counsel to help address long-standing complaints of discrimination. EPA hired a new director last April to take the helm of the civil rights office, sparking hope among activists that she'd invigorate efforts to tackle the backlog of complaints (Greenwire, April 1, 2014). Under the Obama administration, the civil rights office "went about taking some of the earliest and probably easiest cases and figuring out if there's something that could be investigated," said Lisa Garcia, who was EPA's environmental justice adviser from 2009 until last year. "One of the reasons you still have cases in that backlog is that the situations are so old. Complainants may not even be around, may not be interested," she said. "It's so stale." Garcia suggested that EPA put the older cases "into a new bucket." For cases where communities are still impacted or overburdened, the agency could take steps to try to remedy the general situation. Meanwhile, long-standing complaints remain unanswered. "I kind of thought, being somewhat foolish and naive, that when we had a Democratic president we'd get a little more interest and excitement and have a chance," Schmitter said. "But it didn't matter. Whichever party was in there, the EPA was equally ineffective and nonresponsive." Miller-Travis of EPA's environmental justice advisory council said there's "no question" that the Obama EPA has shown improvement compared to previous administrations on the civil rights front. "You'd have to say that there is much more effort and energy going on to try to fix what has not been working in the Office of Civil Rights," she said. But while increased dialogue with EPA has been welcome, she said, "in terms of demonstrative examples of progress, there's not a lot to show for it."